Magnifications refer to a 13 inch (32 cm) wide screen set to 800 x 600 pixels. 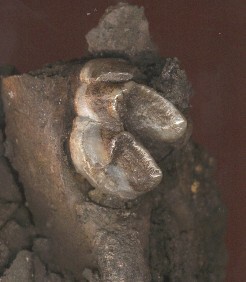 Partial tapir mandible, one of first specimens found. 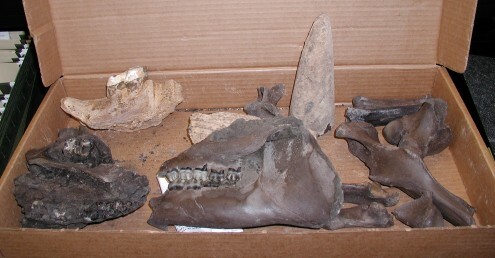 Parts recovered seperately by Martin Kohl and Larry Bolt. 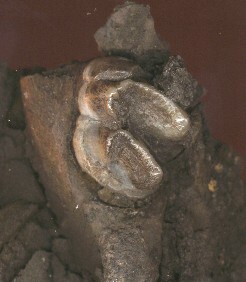 Tapir lower leg bone, recovered by Robert Price. Approximately natural size. center, is from a large but yet unidentified proboscidian. Photo Dr. Robert Hatcher. 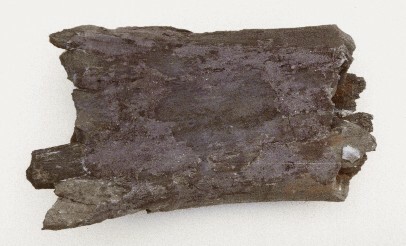 Large bone fragment, further crushed by bulldozers; reconstructed measures about 10 x 20 x 35 cm. White object is angular chert fragment, from encasing sediment. 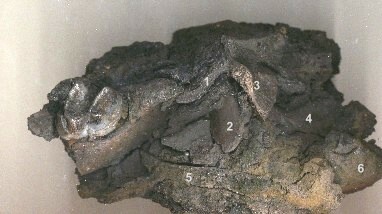 through 6), additional bone fragments. 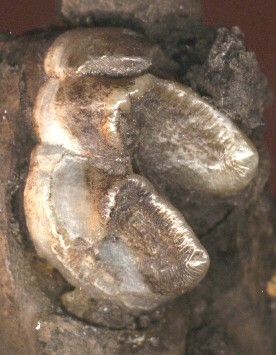 Close-up (times four) of molar above. Conservation note: The mineral marcasite (orthorhombic iron disulfide, FeS2) is present in some of the fossils and matrix. 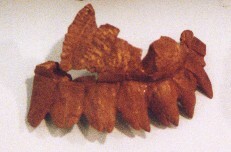 It may be visible as a dark brassy material in cavities of bones, as above, natural size, and 4 x magnification. More often it exists as a greenish black component in matrix, where it can be recognized by the persistant sulfur odor. Mineral and rock specimens containing marcasite often tarnish, corrode, and crumble over several years or decades. Measures will need to be taken to assure this does not happen. 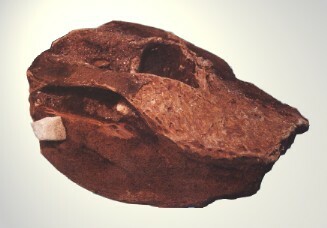 Additional bones: These contain larger images and may take considerable time to download.